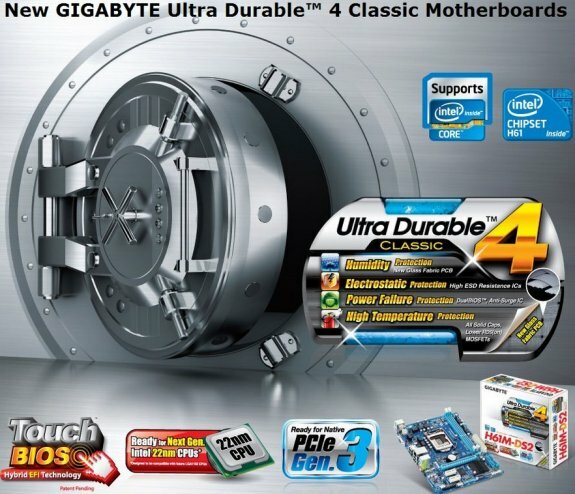 Gigabyte introduced its latest Ultra Durable motherboard construction concept. The Ultra Durable 4 technology improves Ultra Durable 3 by addressing problems of humidity, electrostatic discharge, high temperature and power surge. Humidity is a natural element, moisture eats into components that have pure metals such as aluminum and copper, over time. Electrostatic discharge has a devastating impact on sensitive electronics, while power surges, usually caused after recovery from a power outage, can fry power conditioning electronics of the motherboard. And then we all know what high-temperature can do to tiny capacitors and FETs. Gigabyte plans to address humidity using a new fiberglass PCB material, that provides a level of insulation. While not exactly addressing condensation, it will reduce corrosion of PCB contacts against moisture. Moving on to ESD protection, ICs used on Ultra Durable 4 motherboards will be so chosen to be highly resistant to ESD. Addressing power-surges, Gigabyte is going to use an active surge protection system that goes beyond fuses. There will be a surge-protection IC. Ultra Durable regulars such as high-grade solid-state capacitors, ferrite-core chokes, and low RDS(on) MOSFETs address the problem of temperature. One of Gigabyte's very first Ultra Durable 4 motherboards is the GA-H61M-DS2, a micro-ATX socket LGA1155 motherboard based on the Intel H61 chipset. This board features PCI-Express 3.0 slots, is ready for upcoming 22 nm Ivy Bridge processors, and uses HybridEFI BIOS that lets you boot from volumes bigger than 2.2 TB in size.